Every Workplace Needs A Mascot | how's it going, eh? 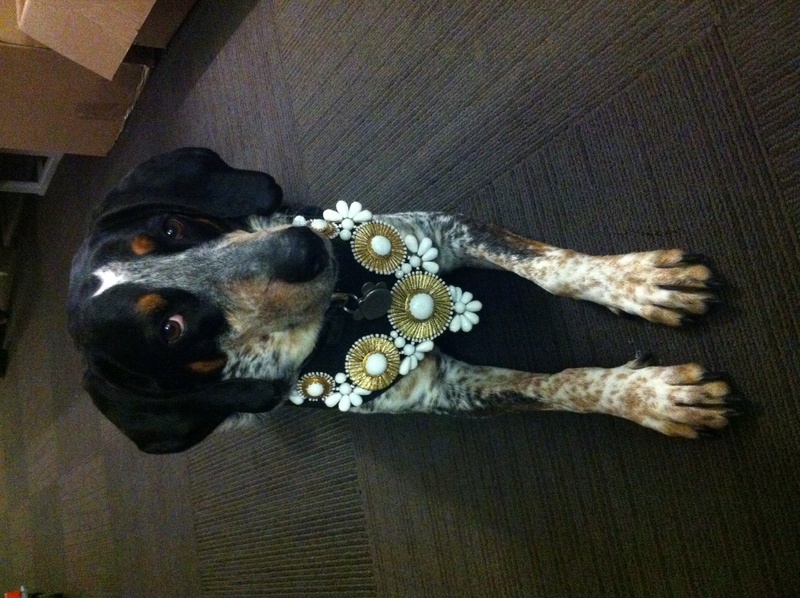 Daisy, our costume mascot is the highlight of my day. The icing on my cake. The wasabi on my sushi. When she is visiting the costume department, all the heaviness is lifted. Nothing is too important or serious when Miss Daisy is around. Princess Paws decided to get into the spirit + gussied herself up today! Look how sparkly + gorgeous she is with twinkles dancing in her eyes!!! 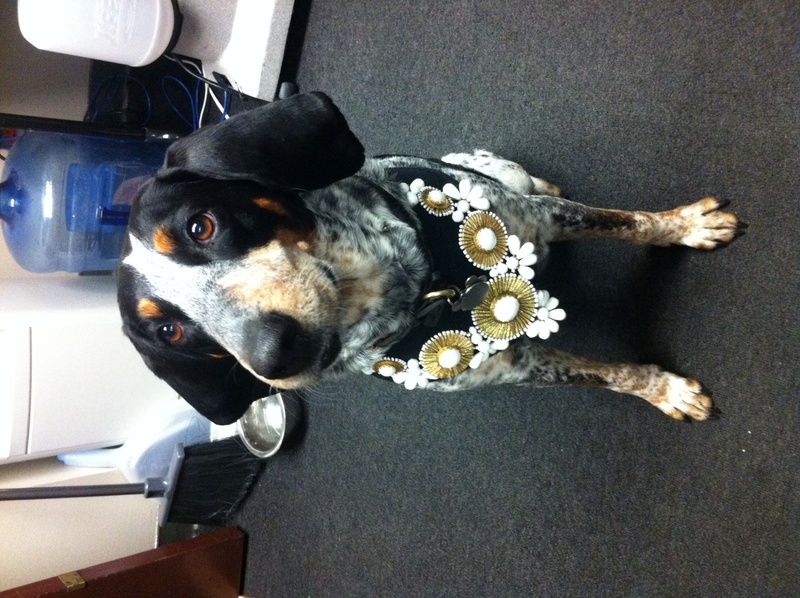 She is OWNING her new necklace! She is telling that necklace who’s boss!!!!! This little sassafrass was so excited that she FINALLY decided to help us out with wrap, instead of spending all day napping, being adored, petted + kissed! She was like, “Yes, ma’am! No, ma’am! Right away, ma’am!”. 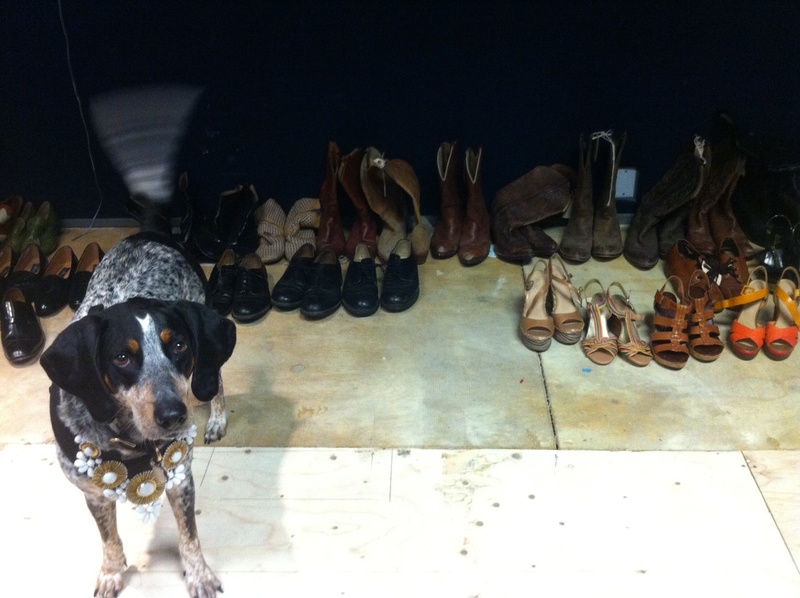 Even going as far as helping us out with the shoes!!!! Can you tell how amped she is about it, by the blur of her tail? It was like a metronome gone mad! Well, it’s about time!! Pretty jewelry = instant mood lifter! Our newest 705 member (that’s our costume union) really is the tops. Uh-oh, wait. Hold up. Me spoke too soon. Yikes, if looks could kill. It speaks volumes. I get it, Daisy. Enough is enough, you say? Copy that. Time to go home! Aw, that’s such a shame!!! Animals bring such a different atmosphere to the workplace + lifts everyone’s moods!!! !